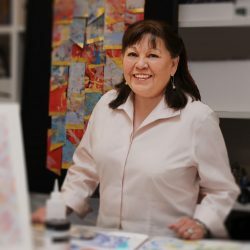 Celebrated for her tapestries and works on paper, Ramona Sakiestewa is a central figure among contemporary Native American artists. Born of Hopi ancestry and raised in the American Southwest, she educated herself in the art of weaving by evolving and adapting ancient Pueblo techniques. Sakiestewa is renowned for her tapestries and works on paper – clever compounds of postmodern critical method, highly individuated abstract language, and her culture’s ritual imagery. Her watercolors frequently serve as starting points for her highly regarded architectural and site work. Able to synthesize numerous artistic traditions and media, Sakiestewa is widely sought after for specific commissions. She has designed two limited edition series of commercially woven blankets. The first series was inspired by historic trails of the Southwest; the second by the ancient cultures that inhabited National Monuments in New Mexico and Arizona. Exhibiting a profound understanding of other modern and contemporary artists, her studio has also woven their designs. The Frank Lloyd Wright Foundation commissioned Sakiestewa to weave thirteen tapestries from the architect’s drawings. Working with Gloria Frankenthaler Ross, her studio also wove several tapestries for the painter Kenneth Noland. She has served as a design consultant working to build the National Mall facility of the Smithsonian’s National Museum of the American Indian. Moreover, she mentored the development team for the master planning of “Our Universes,” one of three major permanent gallery themes for that institution. In addition to the National Museum of the American Indian, Ramona’s public art and design projects include the Tempe Center for the Performing Arts, Tempe, AZ; the America West Heritage Center, Wellsville, UT; the Chickasaw Cultural Center, Sulphur, OK; and Marriott Hotels in Washington, DC and Sacramento, CA. Sakiestewa’s contribution to the arts extends beyond the objects of her making. As a former chair of the New Mexico Arts Commission, the first Native American director of the Southwestern Association on Indian Affairs (SWAIA), and a founding member and former director of Atlatl (a national Native Arts organization headquartered in Phoenix, AZ), she continues to exercise a significant influence on state and federal arts policy. She is also the recipient of numerous awards for her artwork including the New Mexico Governor’s Award for Excellence in the Arts, the Governor’s Outstanding New Mexico Woman’s Award, recent induction into New Mexico Women’s Hall of Fame, and several first place wins in Contemporary Weaving at Santa Fe Indian Market. Ramona Sakiestewa has exhibited extensively in numerous solo exhibitions and group shows. Her work is held in the collections of many important arts venues including: The National Museum of American History, Smithsonian Institution, Washington, DC; The Museum of Fine Arts, Santa Fe, NM; The Heard Museum, Phoenix, AZ; The St. Louis Museum of Art, St. Louis, MO; and, The Denver Art Museum, Denver, CO.
National Indian Monument and Institute, Tulsa, Oklahoma: Member of the core master planning team for a new cultural center. With Andrew Merriell & Associates, Interpretive Planning & Design, Santa Fe, NM and Johnson, Smitthipong and Rosamond Architects, Tucson, AZ. Marriott Residence Inn, Sacramento, CA: Design consultant to developer (Christopher Corporation, Three Fires, and Marriott) and interior designer (Johnson Braund Design Group) for design themes and artwork for planned business hotel. I was born in the American Southwest. At an early age, I knew I would be an artist. Having had a somewhat harried childhood, I did art making as a way to create order out of uncertainty. My professional art career began in tapestry weaving. That art form allowed for the blending of shapes and layering of colors. Early work was graphic in design. That eventually evolved into abstract and painterly weavings. Off and on for 20 years, I did printmaking as well. Five years ago, I began to focus on what I call “constructions” Making them involves deconstructing the earlier prints and then painting and drawing on additional pieces of fabrics and papers. I can then manipulate the complex palette of images, patterns, and surfaces. With the diversity of materials, one can continue to blend shapes and layer color but in dimensional constructions.